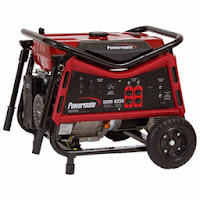 Portable power generators are the best way to supply electricity to your home during a power outage, and they’re also great for times when you are away from other sources of electricity, such as during camping trips. However, choosing the generator that is right for you can take some research. Among the many factors you must consider are the type of fuel the generator uses and its maximum output. Here are three generators that have what it takes when you need electricity in an emergency. This Pulsar generator provides a winning combination of convenience, portability and power, and it will satisfy your needs at home or for outdoor projects off the grid. The generator runs on either gasoline or liquid propane, which allows you to purchase whichever is less expensive or easiest to obtain. The Pulsar Dual-Fuel Peak 4500W includes several advanced features, such as a tubular steel frame for durability and solid tires that will never go flat. In addition, it will produce 120 volts to 240 volts of electricity for 15 hours on four gallons of gasoline or 20 pounds of liquid propane. The Gentron PMC105007 is a portable propane-powered generator that can produce 5,000 watts of electricity at peak capacity. This is one of the most efficient generators in its class, and it’s officially classified as a green generator because of its mild emissions. It’s rated to run at half capacity for 10 hours on 20 pounds of fuel, and it includes several safety features to protect you and the environment. Approved by the EPA and the California Air Resources Board (CARB), this Gentron generator operates quietly, weighs 103 pounds and measures 23 inches by 23 inches by 32 inches, so it can be easily transported and stored. LIFAN Power USA is known across the country for manufacturing some of the most advanced generators in history. The Energy Storm 2600iER is sleek, efficient and highly portable. It’s one of the quietest generators on the market today, and the electricity it produces is so clean and even that it can be used to power highly sensitive electronic equipment, including computers, cameras, smartphones and LCD TVs. This unit has a built-in handle so that it can be lifted off the ground, but it also includes wheels and a collapsible handle just like a modern suitcase. It features an electric ignition and can produce 2600 watts steadily for seven hours on 1.58 gallons of fuel. 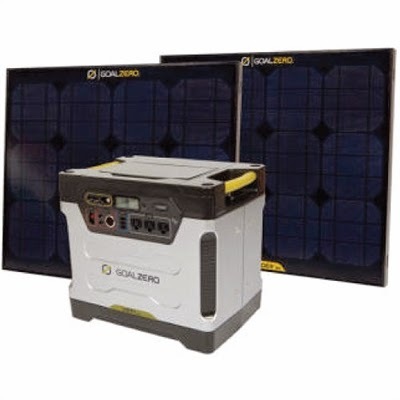 This super heavy-duty solar generator stores 1,250 watt hours of power and is an excellent backup power source for offices, schools, and the home. It is easy to use safely and silently indoors with no worries. With the 1,000 watt inverter it is capable of running mid-sized appliances, power tools, emergency lighting, laptops, and smaller hand held devices. It features several charger ports for charging many devices simultaneously: 3-USB ports, 3-12V DC ports, and 3-AC ports. 2 Boulder 30 watt solar panels are included. Buying an emergency power generator doesn’t have to be fraught with guesswork. The four generators above are all highly rated and will provide you with power when you need it most. All you have to do now is decide which size and style is best suited to you and your requirements.